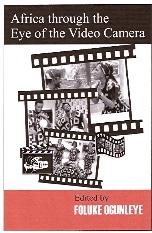 Africa Through the eye of the Video Camera has emanated from the African Video Film Arts Festival, which held at the Obafemi Awolowo University, Ile-Ife, Nigeria in October 2007. The twenty-three articles in this book have been selected thematically. The articles ask us to re-examine our usual assumptions about artistic excellence and culture. They also deal with foundational issues about the video film industry such as African identity as basis for the video film, evolving an apposite nomenclature for the industry and developmental issues affecting the Video film. Legal and economic environments of the video film formed the basis of some of the articles. They made relevant suggestions about reviewing current laws and making new ones to create a better environment for the sustenance of the video genre. Country reports are presented about Nigeria, Ghana, Kenya,Uganda and Senegal. These reports have concentrated on the inner workings of the local video film industries in each of the countries and audience response to the films. Images of women, as portrayed through the films have received informed engagement by feminist scholars, while functionalist ethos resounds in some of the papers. This book, emanating from the auspicious meeting of video artists and film scholars has definitely provided a forum for postulations and theorizing that will move the art forward on the continent.